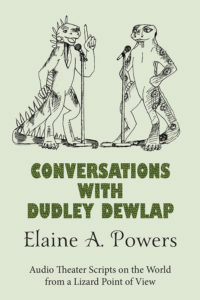 Conversations with Dudley Dewlap: the World from a Lizard Point of View is a collection of short comedy, small cast, audio scripts. Most roles are gender neutral. The primary characters are talk show hosts who discuss various amusing topics. The scripts can be combined or used individually. Additional cast can be used for the sound effects. Along with being entertaining and family friendly, many of the scripts are also educational. The scripts are amenable to radio theater, readers’ theater, or may be adapted for stage. Approximate running times vary with each script, ranging from 5-20 minutes. A delightful theater-style script in the form of radio interviews from a lizard point of view. The stars of our little act are Miles the monitor and Dudley, an iguana. In a setting of personal interviews, interviewing each other and occasionally guests featuring others in the general family such as reptiles and dinosaurs, the two keep a lively repertoire discussing who and what they are. Powers, who shares her home with a half-dozen iguanas, is an expert who has taken the time to share her knowledge in a fun environment, probably meant for about a fifth grade level, where teachers or reptile club members can learn educational facts about these creatures. [For example] lizards don't have vocal chords. We learn this when the iguana's friends audition for the opera. Alligator wins the part as he can bellow pretty loud. Written in play form there are instructions for special props and suggestions of names should one of the participants be a female. All in all a humorous educational tool that is fun to read.